Let the pumpkin decor continue! Today's ideas can be featured inside and outside of your home. I hope these can get your creative juices flowing. October is just around the corner! 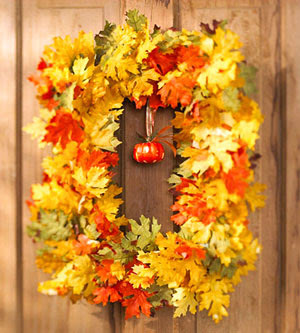 Square wreaths are a great break from the norm and this leafy one, is no different. You can bring the colorful foliage from the trees right to your front door. 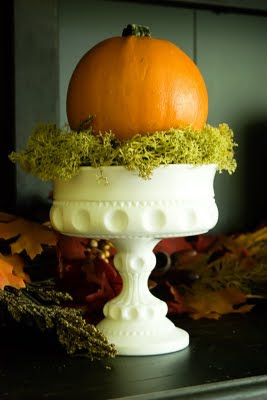 And although the "pumpkin" part of this idea is minimal, it is the perfect accent to create a harvest welcome. And it can be featured all the way through Thanksgiving! 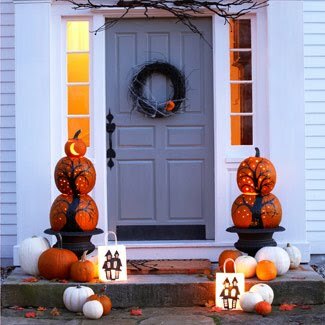 These painted pumpkin topiaries offer another way to welcome guests and trick-or-treaters to your home. 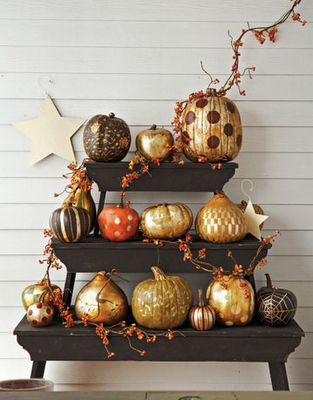 The painted trees and punched out stars are a simple and unexpected way to dress up your pumpkins and front porch. Boo! You can create your own spooky pumpkin message with the help of a plunger apple corer. Who said it could only be used on apples? This design takes little to no effort, but look how classic and timeless the end result is! All you need is a footed stand, a bag of moss and a pumpkin. It can't get much easier than that. Fall is finally here which means fall fashions are about to hit the streets as well. 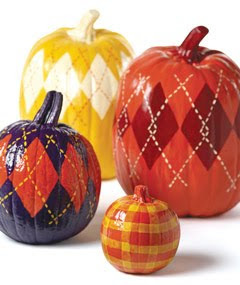 Why not transfer your favorite fall patterns to your pumpkin. After all, nothing says autumn like a little argyle and plaid. Continuing with the paint theme, check out these metallic beauties. If plaid and argyle aren't your style, that's okay. Let your imagination can go wild. Even a simple polka dot has a new look when it's done with metallic paint. For a bigger statement, showcase all of your pumpkins together. 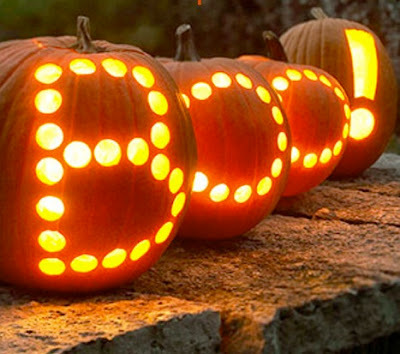 Make a day of it and have each member of the family create their own works of pumpkin art. When they all are put together, they're sure to make a bold statement.